1. 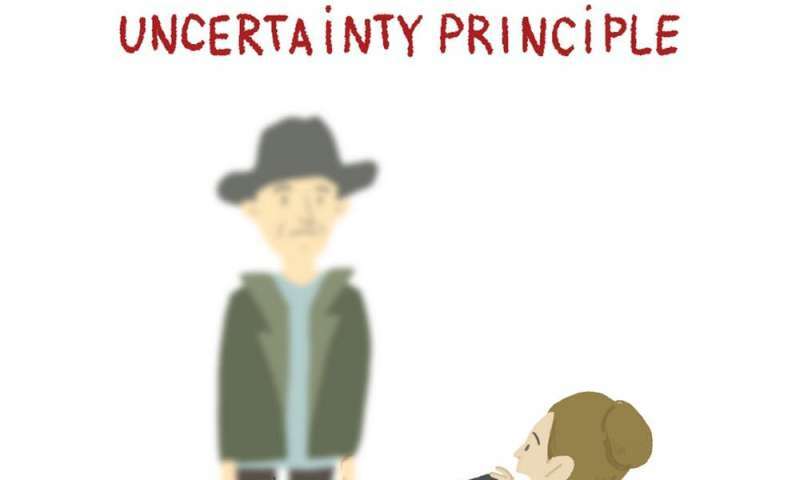 "Quantum physics is all about uncertainty"
This myth originated partly in Werner Heisenberg's "uncertainty principle". He showed that there is a limit to how accurately two quantities – for instance a particle's speed and its position – can be measured simultaneously. When quantum physics is used to calculate other quantities, such as the energy, or the magnetic property of atoms, it is astounding in its precision. 2. "Quantum physics can't be visualised." Quantum physics describes objects that are often "strange" and difficult to put into pictures: wave functions, superimposed states, probability amplitude, complex numbers to name but a few. People often say that they can only be understood with mathematical equations and symbols. And yet we physicists are always making representations of it when we teach and popularise it. We use graphs, drawings, metaphors, projections and many other devices. Which is just as well, because students and even veteran quantum physicists like us need a mental image of the objects being manipulated. The contentious part is the accuracy of these images, as it is difficult to represent a quantum object accurately. 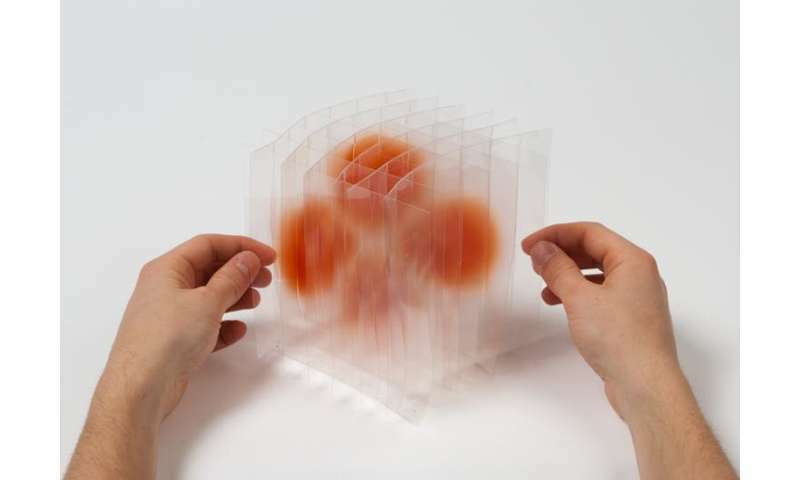 Working together with designers, illustrators and video makers, the Physics Reimagined research team seeks to "draw" quantum physics in all its forms: folding activities, graphic novels, sculptures, 3-D animations, and on and on. 3. 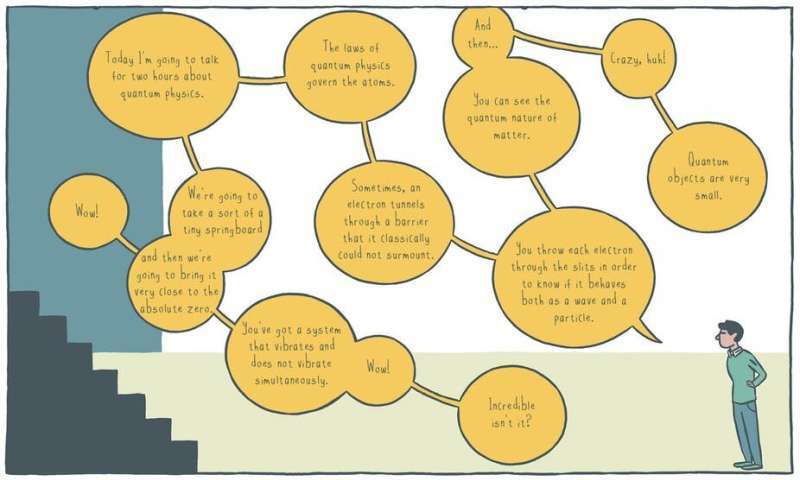 "Even scientists don't really understand quantum physics"
One of the leading lights in the field, Richard Feynman himself said: "I think I can safely say that nobody understands quantum mechanics." But he then immediately added: "I am going to tell you what nature behaves like." Niels Bohr, one of the founding fathers of the discipline, gives a good summary: "Those who are not shocked when they first come across quantum theory cannot possibly have understood it." Physicists do understand what they're doing when they're manipulating the quantum formalism. They just need to adapt their intuitions to this new field and its inherent paradoxes. 4. "A few brilliant theorists came up with the entire concept of quantum physics"
Further fundamental experiments followed, including electrons that bounced weirdly off nickel, silver atoms strangely deviated by a magnetic field, a perfectly conducting metal at low temperatures and so on. Theories and concepts then emerged once again: duality, spin or superconductivity were introduced. The highly productive "back and forth" exchanges between theory and practice are what physics is built on. Experiments generally come first, except in very few cases. 5. "Einstein was quantum physics' worst enemy"
Poor old Albert Einstein is often depicted as having been a virulent opponent of quantum physics, probably because of his famous quote, "God does not play dice with the universe." Yet he wasn't against it and what's more, he created it! In 1905 Einstein wrote his foundational article, "On a Heuristic Viewpoint Concerning the Production and Transformation of Light", based on the work of Max Planck. In it, he proposed that light was made of small, individual and quantified bodies, called photons. This is what won him the Nobel Prize, in fact, not his work on the theory of relativity. Einstein probably earned that reputation because of his discussions with Niels Bohr, especially on the idea of interpretation and quantum reality, as he didn't accept the concept of nonlocality. Later, experiments on entanglement and violation of Bell's theorem proved him wrong and showed the absence of hidden variables. Einstein fully appreciated the relevance of quantum physics, he just had a few problems with some of its implications, especially as regards locality. 6. "Quantum physics has no practical use"
7. "Quantum physics might explain certain alternative therapies and other mysteries"
Many people who believe in paranormal phenomena and in certain "therapies" claim to be inspired by quantum physics. Indian-American Deepak Chopra is one of the most famous proponents of this approach. He has developed a kind of quantum mysticism in which a pseudo-New Age spirituality finds its credentials in scientific jargon such as "human quantum-body essence", "localised field of energy and information with cybernetic feedback loops", and "harmonisation of the quantum mechanical body". He then purports to establish quantum relationships between mind, consciousness, matter and the universe. "Quantum therapies" also offer care protocols based on the body seen as "a vibration and energy field", host to "vibrating states" and "bioresonances". 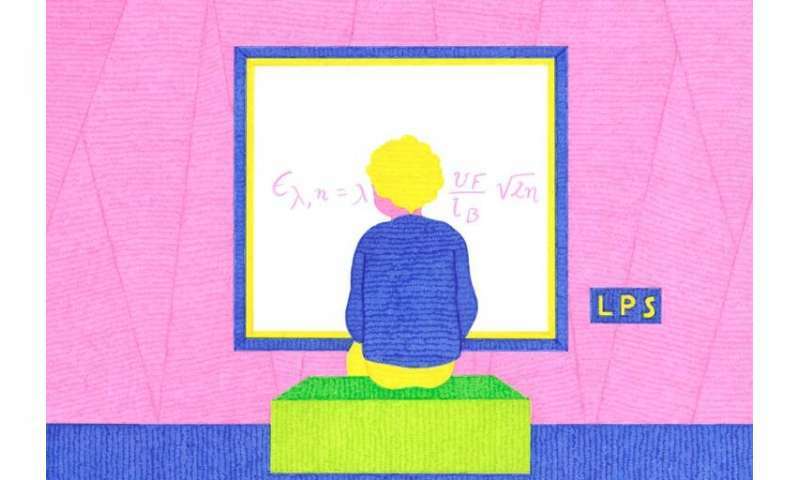 More cheating can be found when quantum properties are extrapolated to a human scale. To be absolutely clear, quantum properties such as superposition of states or quantisation don't apply in the living world on a human scale. 2012 Nobel Prize–winner Serge Haroche proved this with his experiments. When an object interacts too much with its environment and becomes too large, it is no longer a quantum object. However, I wouldn't like to judge those who wish to test this approach, which belongs to the realm of belief, not science. Everyone can do as they wish, of course. I would only ask people to refrain from pretending it has any scientific basis in quantum physics. Any such claim is simply false. That's it! I hope that I managed to debunk quantum physics a little. In the end, it is just like any other scientific discipline. Lol. Another crank in our midst! It seems to me that you go a bit too far in asserting that understanding quantum mechanics is straightforward. Your declaration that "there is no mystery" is in conflict with your characterization of "this new field and its inherent paradoxes." Just consider that the Schrodinger equation describes a wave whose squared magnitude tells you the probability to find a particle at each position. Personally I call that mysterious, though certainly not in any mystical way. Thanks to Julien Bobroff for clarifying matters. What is proved by the impossibility proofs is lack of imagination. Anyone dissatisfied with these ideas may feel free to assume that there are additional parameters not yet introduced into the theory which determine the individual event. A theory that yields "maybe" as an answer should be recognized as an inaccurate theory. It seems clear that the present quantum mechanics is not in its final form [...] I think it very likely, or at any rate quite possible, that in the long run Einstein will turn out to be correct. There is now in my opinion no entirely satisfactory interpretation of quantum mechanics. "I try to demonstrate, furthermore, why in my opinion the quantum theory does not seem likely to be able to produce a usable foundation for physics: one becomes involved in contradictions if one tries to consider the theoretical quantum description as a complete description of the individual physical system or happening. On the other hand, up to the present time, the field theory is unable to give an explanation of the molecular structure of matter and of quantum phenomena. It is shown, however, that the conviction to the effect that the field theory is unable to give, by its methods, a solution of these problems rests upon prejudice." This is one of his milder quotes. I can give here many more. You judge from this Einstein's view on Quantum Physics. lol...photons as particles...breaks the law of conservation of energy. lol...electrons....a million dollars and a prize to call it a particle. In 1936 the development of Fock states and second quantization were not well understood. In addition non-locality was not well understood; JS Bell would not publish his eponymous theory until 1964. "Quantum field theory" wasn't even a thing. Einstein was that most valuable of people: an iconoclast. That doesn't mean he was right; it just means he thought deeply and made good arguments to support his position. And he certainly didn't hate QM; he damn near invented it with his paper on the photoelectric effect, the paper for which he won a Nobel Prize in Physics. So, no, I wouldn't say Einstein was an "enemy" of quantum physics. And I certainly wouldn't try to use anything Einstein said to "disprove" QM. photons as particles...breaks the law of conservation of energy. Ummmm, how, exactly? Considering we can detect single photons with 19th century technology scintillation screens. A photon is a man made abstraction...a 2d segment of a wave on a graph. If a photon is a real physical particle, then you would need an infinite number of "photons" in order to account for every direction illuminated in a sphere expanding out from the light source. You would also need to account for a "photon's" reacceleration after leaving a medium through which it travels slower. There are no dualities in nature. Sound waves are compression and rarefaction, and there is no such thing as a sound particle. There is also no such thing as a photon particle. No, a photon is an impact on a scintillation screen. Like, you know, one of those experiment thingies that provides data. And you are also wrong about the sound particles; they're called phonons. Quick tip: probably best not to bloviate about physics on the physics site if you don't know any physics. I sense a block in your immediate future. From, you know, the quantum resonances and stuff. And you didn't say why photons = infinity. You merely did some handwaving that had nothing to do with it and then made the same assertion again. The average IQ is 100. Pitiful. Duhhhh ummmm. And compression and rarefaction isn't a duality? What's this, an extreme comedy sketch? There are no dualities in nature. Phonons are not real particles. Sound is a wave not a wave-particle duality. resonances are of the medium. Phonons are still not real particles even in a resonating crystal medium. Enough with the insulting please. What about compression and rarefaction? In the same wave. Which means, yes, at the same time, compression over here and rarefaction over there, at the same time. Not just real clear on what a "duality" is, nor how sound works, are you? I don't think that anything can be two different things at the same time. Block engaged. I don't bother with trolls who use the argument from ignorance. It's dishonest and I only bother with honest people. You cannot possibly be arguing that a sound wave, frozen in time, doesn't have alternating zones of compression and rarefaction in different places at the same time, unless you're so abysmally stupid you have no idea how sound works. And you still haven't explained how photons make energy infinite. Noticed you tried to avoid that one. Again, enough with the insults please. You're not insulting me. Who are you insulting?